Freshman point guard Daisa Harris. KENSINGTON, Md. — Entering this season, there were plenty of reasons to assume that the Albert Einstein High School girls basketball team was bound for another hapless campaign. But even though last year’s squad managed just two victories and lost MVP Ann-Marie Gabriel to graduation, coach Tim Hobbs knew help was on the way. Freshman point guard Daisa Harris, who turned heads last year while leading her Newport Mill Middle School team to an undefeated season, has stepped into a starring role early in her high school career. 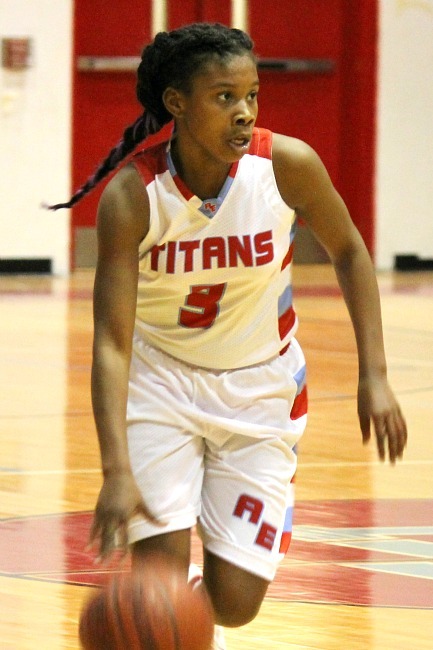 With Harris’ ball-handling skills and athleticism leading the way, the Titans (4-11, 4-5 Montgomery 3A/2A) matched last season’s win total six games into this year’s schedule and hope to carry that momentum forward through the end of February.